It was brought to my attention (thanks Bill S.) that an episode of sudden upper tropospheric warming has been quantified in the peer-reviewed literature. Though I had ruled out sudden warming in earlier updates, I had only been considering buoyant cumulonimbus ascent, in which case a 30-degree rise in the cloud would be unprecedented and indeed unsupportable by the theta-e profiles in the air mass feeding the storm, though if it did occur the vertical velocities and turbulence potential would be astronomical. Though stratospheric "warm sinks" and "cold domes" have been a part of forecasting for years, this paper proposes a very intense, small-scale, convectively driven downdraft mechanism caused by the penetration of a mesoscale convective system into the stratosphere. The paper identifies a scale of about 75 km in width and an anomaly of 18 Celsius degrees. Any forced downward motion from the stratosphere like this will cause very strong adiabatic warming and associated drying, characterized by a profound lack of high cloud layers and low radiance on water vapor imagery (which by a stroke of luck is most sensitive to the upper troposphere). Since a mesoscale signature like this is well within the sampling capability of the GOES and METEOSAT platforms, I immediately reviewed the water vapor loop (SSEC) shown below. However it does not appear to show any anomalous subsident signatures. The area to the north of the MCS appears to show normal synoptic-scale subsidence within the trade wind inversion and the A330 is not believed to have made it this far north anyway. I do have grave doubts a warm, mesoscale subsident area would be enough to significantly disrupt the A330 flight, and occurring in clear air there is a good chance any failure would be recoverable. I will however continue pondering this idea, will work this topic into the study, and will be glad to entertain other thoughts in this direction. The mystery continues. Water Vapor Loop chart showing significant building activity across the Air France Flight 447 flight path. This study was revised extensively on June 4 to factor in new meteorological information that's been assimilated. There are some awesome new graphics in this revision. As for the findings, they are not much different; instability with this MCS (mesoscale convective system) has been found to not be exceptionally strong, though turbulence still appears to be the leading candidate as a weather-related factor. Lightning would be the other one, though I absolutely cannot vouch for whether the A330 is a vulnerable aircraft or not. As is my policy I am sticking only to what I know, and will not address any issues of aircraft design, CRM, or flight procedures as crash factors. I will leave that to great sites like the airliners.net forums to debate on. Attention media: I have NOT forecasted for Air Force One. An astute reader clued me in to a sentence here that read "...forecasting for the Air Force. One of my..." and I think a number of speed-reading journalists didn't see the punctuation. I have adjusted the sentence so it's not so confusing. Many thanks to SAR Pilot Seagull Tango for spotting this error. 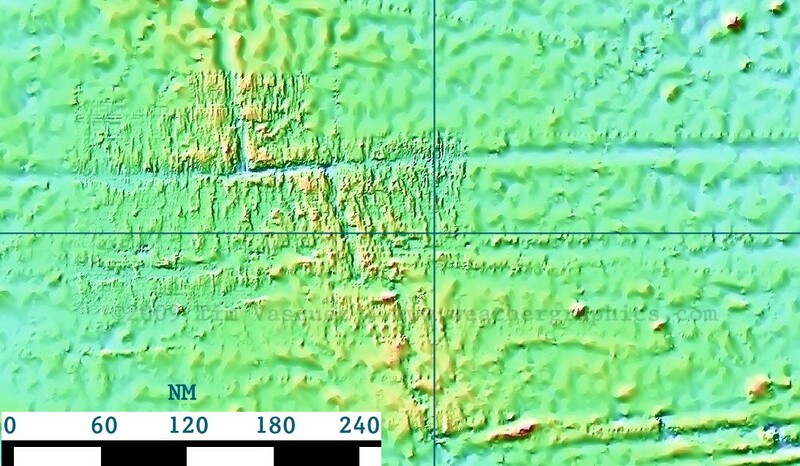 Finally, here is an ocean bottom map at the projected 0215Z crash location; it is from http://topex.ucsd.edu/. I can't find precise depth information but it looks to be about 13,000 ft in the Atlantic rift zone. I'm hoping we get those FDRs and CVRs up safe so the valuable lessons from this crash can be unravelled. Air France flight 447 (AF447), an Airbus A330 widebody jet, was reported missing in the equatorial Atlantic Ocean in the early morning hours of June 1, 2009. The plane was enroute from Rio de Janeiro (SBGL) to Paris (LFPG). Speculation suggested that the plane may have flown into a thunderstorm. The objective of this study was to isolate the aircraft's location against high-resolution satellite images from GOES-10 to identify any association with thunderstorm activity. Breakup of a plane at higher altitudes in a thunderstorm is not unprecedented; Northwest Flight 705 in 1963 and more recently Pulkovo Aviation Flight 612 in 2006 are clear examples. I did flight route forecasting for the Air Force in the 1990s. One of my assignments in summer 1994 was forecasting the sector between Mombasa, Kenya and Cairo, Egypt for C-5 and C-141 aircraft. 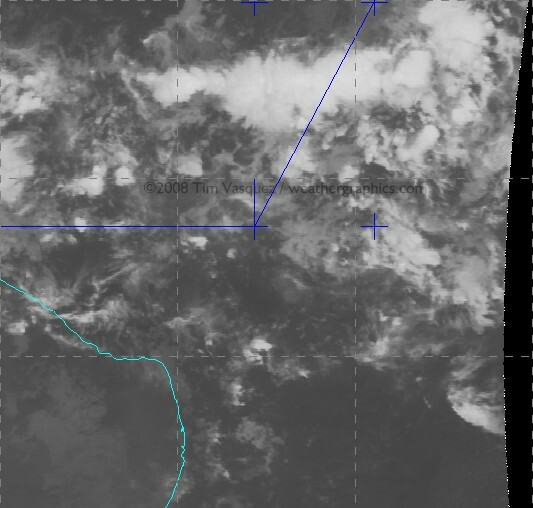 The Sudan region had tropical MCS activity similar to this with little in the way of sensor data, so this incident holds some special interest for me as one of our C-5s could easily have followed a very similar fate. Using what's available to me I decided to do a little analysis and see if I could determine anything about the fate of AF447 and maybe through some circuitous, indirect means help give authorities some clues on where to look. Thanks to an anonymous contributor (thank you, sir!) I was given the flight plan for Air France flight 447, which is shown here. This verifies against position reports that were published in the media Monday night. Air France Flight 447 reported on HF radio that it had reached INTOL (S01 21.7',W32 49.9' or -1.362,-32.832) at 0133Z and was estimating it would reach TASIL (N4 00.3',W29 59.4', or +4.005,-29.990) in 50 minutes (a true track of 28.1 deg) (source) on oceanic high altitude route UN873 (see below). Figure 2. Enroute High Altitude Caribbean and South America H-4, 30 AUG 2007 (National Geospatial-Intelligence Agency). I decided to project the flight forward from INTOL. An altitude of FL350 and speed of 520 mph was given. Presumably this is ground speed according to the ACARS specification. Compensating for a 10 kt headwind as given by the SBFN sounding this yields an airspeed of M.80, which correlates well with the A330's typical early cruise profile. This yields the following extrapolated aircraft coordinates. As of June 4 these estimates are still good and have not changed. Figure 3. Projected flight coordinates.. Surface analysis showed the suspected crash region to be within the intertropical convergence zone (ITCZ), which at this time of year is usually found at about the 5-10N parallel. A region of strong trade winds covered most of the tropical North Atlantic and this kept the ITCZ in a somewhat southerly position. The linear convergence along the ITCZ and the unstable atmospheric conditions combined to produce scattered clusters of thunderstorms. The upper level charts were absolutely devoid of observed data in the equatorial Atlantic region except for the balloon launch from SBFR and a few ACARS reports from transoceanic flights. See 250 mb, 500 mb, 700 mb, and 850 mb. Most of the wind barbs seen here are from satellite estimates and a few others are from ACARS inflight reports (starred symbols). The aircraft temperatures here are not regarded as the FL330 reports near SBFR show poor correlation with the 33.1 deg C value obtained from the SBFR balloon launch. Using McIDAS I acquired satellite GOES-10 satellite data from UCAR and centered it over the region between INTOL and TASIL. I then plotted the waypoints using McIDAS's built-in coordinate entry panel. Since the source satellite images are georeferenced NOAA/GINI datasets, the points shown here are very accurate and are NOT placed by hand but by lat/long coordinates to the nearest 0.001 deg (0.06 mile). In the image below, the stationary southerly point in blue is INTOL and the aircraft's estimated location from the above table is marked with a cross. Graticule spacing is 5 degrees. For the orange temperature plots I used the NCL/3aw curve; the sharp gradient of the enhancement from dark to light occurs at 243K (-30 deg C), indicating a cloud top of FL310 assuming the satellite pixel is completely overcast with that layer (which is not always true). Figure 5. Satellite loop showing expected flight track. Hit RELOAD if you don't see the satellite images in the looper. Raw infrared images are also available here: 0145Z, 0200Z, 0215Z, 0230Z. Figure 6. View of AF447 track using GOES imagery, 0215Z 1 June 2009. GOES-10 is located at the 60 deg meridian. The resulting satellite photos clearly show an active mesoscale convective system (MCS) across the flight path. About 90% of the cloud material seen on the closeup images are actually multiple levels of convective debris fields from dying storms and activity that occurred previously during the day, with extensive cirrus fields. The active thunderstorm areas are actually defined not by the bright coloring but by small-scale mottled areas of cold cloud tops. Compare with this structural diagram below of a similar tropical MCS in the same area in 1977. Temperature trends suggested that the entire system was at peak intensity, developing rapidly around 2300-0100Z and finally dissipating many hours later around dawn. From a turbulence perspective, the cold spots described above would be the areas of highest concern as they signal the location of an active updraft producing new cloud material in the upper troposphere. I've taken a look at some of the new METEOSAT data posted by Scott Bachmeier and it refines some of what we've seen on GOES. The mesoscale convective system is made up of numerous cell clusters. Due to the northerly winds aloft the downdraft areas are carried southward. As a result, the MCS has organized into a configuration with a dominant stratiform area to the south and updraft area on the north side. Also here are some distance/temperature diagrams prepared by Scott Bachmeier: 0130Z, 0145Z, 0200Z, 0215Z along INTOL to TASIL at different times (temperature in deg K) indicating that the minimum cloud top temperature along the flight route averaged -78 deg C (55,000 ft). On June 5 I also received these satellite photos from the Naval Research Laboratory showing satellite signatures, but have not yet assimilated them into my analysis or created captions yet since I just got them: GOES-12 GCD, GOES-12 CTOP, GOES-10 IR, GOES-10 CTOP, GOES-12 IR. Many thanks to NCAR and the Naval Research Laboratory, including Jeff & Rich at NRL, for these images; their message is in the comments and you can visit their website at http://www.nrlmry.navy.mil/sat_products.html. 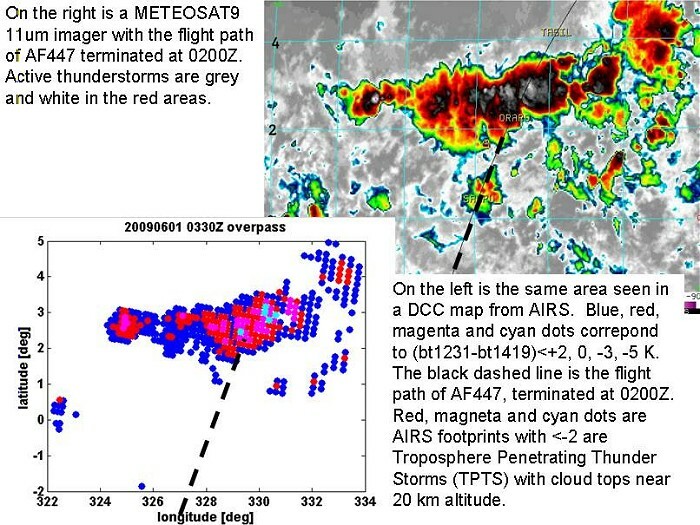 On June 5 I also received Atmospheric Infrared Sounder data courtesy of George Aumann at the Jet Propulsion Laboratory METEOSAT_AIRS_DCC.analysis_sm.jpg, showing the extent of thunderstorm overshoots in the MCS. Above we see an example of the structure in a typical MCS, this one observed on a shipboard experiment in the same general area 35 years ago. It gives some idea of what the aircraft was probably flying through and shows the vertical radar structures that can be expected. * Thermodynamic conditions. In order to obtain a representative parcel for the MCS, it's important to get as accurate a collection of surface and upper observations as possible. Unfortunately the coverage of upper air data was extremely poor. However at the surface, several merchant marine ships and buoys were located in the area. They show a highly homogenized maritime air mass with a predominant temperature figure of 27.0 deg C. This is in equilibrium with the reported sea-surface temperature of 27-28 deg C. There is one report of 23 deg C in rain-cooled outflow air reported by the Jo Cedar ship. The mesoscale analyses also indicates predominant dewpoint temperatures of 23.5 to 24.0 deg C.
Figure 9. Mesoanalysis of buoy and ship reports for 00Z with GOES IR. Figure 10. Worst-case SKEW-T and parcel lift. * Worst case instability. 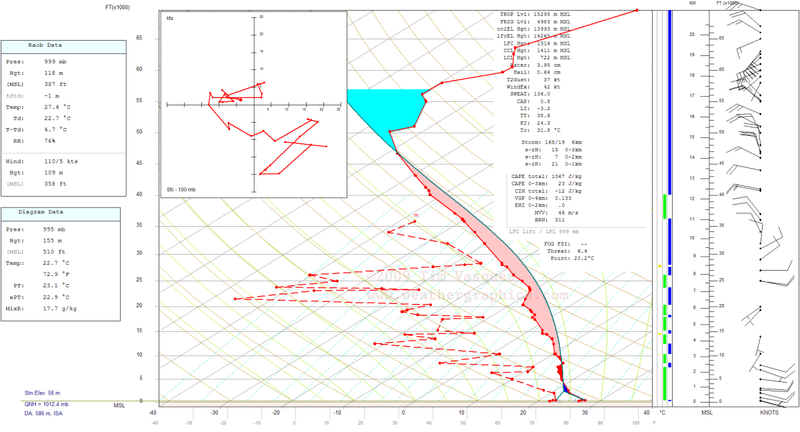 The "worst case" sounding scenario would be the sounding shown above for Fernando de Noronha (SBFN/82400) using a parcel constructed with the dominant 27.0C air temperature observed for that region and for a 23.7 deg C dewpoint, exactly as observed. This yields about the maximum amount of equivalent potential temperature that can be obtained given the atmospheric conditions. The problem is that this method accounts for zero mixing of the parcel, which is unrealistic given the drier air above 2000 ft AGL. The worst-case method also produces extensive -80 deg C overshoots, which were not observed. Since this method yields 1500 J/kg of CAPE, it is believed that CAPE values were not in this range. Figure 11. Most probable SKEW-T and parcel lift. * Most likely instability. Above shows the most-likely parcel as plotted on the Fernando de Noronha (SBFN/82400) sounding for 0000Z. A parcel was constructed that just barely achieves the isolated -80 deg C overshoot temperature detected on METEOSAT imagery. This was readily accomplished with a surface temperature of 27 deg C and dewpoint of 23 deg C (thus it realistically accounts for a certain amount of boundary layer mixing). * Instability values The CAPE value obtained is 1067 J/kg, which by textbook definition is considered marginal for severe weather and typical for the tropics. That is not to say it does not have severe weather risks, as the formula for typical maximum observed updraft velocity is: w=0.5*((2*CAPE)^0.5) which in this case gives 23 m/s (51 mph). It is probable that even this amount of instability was not observed, due to the potential for extensive mixing with an average dewpoint of 18C in the lowest 150 mb. As of the June 4 reanalysis, it is not believed that warmer parcels nor higher CAPE occurred for three reasons: (1) the lack of widespread < -80 deg C tops representing parcels entering the 95-87 mb (FL560-580) layer, which would have had to have been supported by parcels with CAPE well in excess of 1500 J/kg; (2) the homogenous, equable air mass over the open ocean (case in point buoy 31002) which during the week supported continuous 27 deg C temperatures night and day; (3) the lack of differing environmental data to support a different atmospheric profile especially given the general homogeneity of the tropics. * Thunderstorm tops.. Based on the soundings above, my conclusion is that the maximum thunderstorm tops were 56,000 ft with an equilibrium level of 47,000 ft, representing the tops of most parts of the MCS except near the edges. In the worst-case scenario tops reached just short of 60,000 ft. The satellite imagery indicates that numerous cumulonimbus towers rose to at least 56,000 ft, and were embedded within extensive stratiform anvils with tops ranging from 35,000 to 45,000 ft. This kind of configuration is actually quite normal for equatorial storms due to the higher tropopause height, but it emphasizes that the aircraft was certainly within the bulk of an extensive cumulonimbus cloud field for a significant amount of time and that storms could indeed have been a contributing factor to the crash. Figure 12. Probable radar depiction (green/yellow/red shading) based on thermal signatures and conceptual MCS models. Units are arbitrary approximations of radar strength ranging from green (weak) to red (strong). Above is a chart posted in my June 3 update showing the hypothesized radar depiction. This is based on careful enhancement of cloud temperature information. This is just an assumption of course but this is the best guess based on my own experience and the satellite signatures available. It assumes that significant precipitation production is occurring in and around the cold cloud tops, with warmer cloud tops correlating to decaying downdrafts or clouds with little precipitation. Much of the analysis presented here and elsewhere in this article is based on the aircraft's filed flight track, which it would be following faithfully via its internal reference system except for minor deviations. The distance between INTOL (0133Z,-1.361,-32.831) to the airplane's final reported ACARS position (2014Z,3.578,-30.374) yields a distance of 331.5 nm (381.5 sm) (calculator) in 41 minutes. This introduces consistencies because it yields a ground speed of 485.1 kt (558.3 mph), and at FL350 an airspeed of 288 KIAS/M.841 (calculator). [Thanks to Barry Carlson for pointing out an error in previous versions] This is excessive, because AF447 filed for M.82 and would have slowed to M.78 for turbulence penetration. Furthermore based on synoptic scale analysis the plane should have had a 5 to 10 kt headwind for the majority of the route, slowing the groundspeed slightly. Thus the actual airspeed accounting for the headwind would be roughly M.855/293 KIAS. The other distinct possibility here, assuming the final ACARS report time can be trusted, is a discrepancy between the INTOL reported time and the actual crossing time; the HF call may have introduced one or two minutes of error, which would change these airspeed values by 5%! This begs the question of how exactly the INTOL crossing time was obtained and whether it could be in error -- perhaps an airline pilot here can help figure this out. Since the final ACARS position lies slightly west of track UN873 it suggests that perhaps the crew was deviating a few degrees left of the route to avoid the heaviest weather. It was indeed this cell near UN873 (with large red shading) that produced the coldest tops, -80 deg C, on METEOSAT imagery, suggesting a top of at least 56,000 ft. The cross section graphic (Figure 13) above shows my best reconstruction of what the aircraft was likely encountering. Of course this is centered on the planned track from INTOL to TASIL, and the suspected final ACARS call at 2014Z is shown in the zone hatched in green. Again this is shown as a zone rather than a specific point because of inconsistencies in the coordinate data. I've edited this section Monday night to cut down on the speculation about the accident chain, especially since I don't know a whole lot about A330 systems. The airliners.net board and other sites cover the aircraft, CRM, and systems quite well. What I will try to do, however, is summarize what the aircraft probably encountered based on the data and my own experience. * Turbulence -- As of June 4, I still consider turbulence to be one of the prime factors. Extensive reanalysis of upper level data supports instability values of about 1100 J/kg, which is sufficient to be a danger to airline operations. Though commercial aircraft benefit greatly from airborne radar, these radar units detect mainly rain and hail. Updrafts, particularly if they are strong, may form what are referred to as "weak echo regions" and this can create highly turbulent areas which are not detectable on radar. Another concern is the extensive upper-level dry air shown on the SBFN sounding (not counting the anvil debris at 350-300 mb), which may have contributed to enhanced evaporative cooling around the margins of the anvil clouds and aggravated the turbulence experienced by the flight around the periphery of the storm. It is worth considering that cumulative periods of heavy turbulence crossing through the cluster may have caused minor internal damage that progressed in some way into an emergency. * Icing -- With a flight level temperature of -40 deg C suggested by the proximity sounding the A330 would have been flying mostly in rime ice and possibly some clear ice and graupel. Unbelievably however I neglected to mention the contribution of latent heat, which would immerse the aircraft in -36 deg C air when crossing atop an updraft. Supercooled water is usually rare at these temperatures (see here for an explanation) though a couple of expert commenters below have presented different views on the subject. And with -36 deg C this increases the risk of graupel, clear ice, and supercooled water brought to FL350. This temperature of -36 deg C represents the absolute maximum temperature that can be expected at FL350 since it is the highest equivalent potential temperature that can be realistically constructed on the sounding. * Lightning -- Due to the high cloud tops and freezing level at 16,000 ft, there was extensive precipitation by cold rain process and it is likely the MCS was electrified. I have read some claims that lightning detection showed nothing occurring here, and I saw similar indications on the WWLL lightning network, but I believe this is in contradiction with the instability, cold cloud tops, extensive convection, and cold rain process environment associated with this MCS. My belief is that the area is simply too far away from the nearest sferic detection system (Ascension Island). As far what a strike would do to the A330, I have to leave that to to the avionics experts. Some answers might be found at http://www.airliners.net/aviation-forums/. * Precipitation -- A dual engine flameout due to precipitation or ice ingestion is a noteworthy possibility as has been discussed on other sites (specific to the A330 type too). Due to the high water vapor content in the tropics, tropical weather systems can contain exceptionally high values of precipitable water content. The plane, if at FL350, was experiencing flight level temperatures of between -41 and -36 deg C. Supercooled water is considered to be exceptionally rare or insigificant at temperatures below -30 deg C, but if it does occur it does present the possibility of aggravating airframe and engine icing. Overall the plane was mostly in rime ice and possibly some graupel. * Hail -- I got a few comments about hail. I am not entirely convinced that structural hail damage is a factor, partly because I can't recall hearing much about large damaging hail at altitude in my experience with equatorial flight operations. This would require strong instability, which I'm not yet sure we have, not only to grow the stones but to loft large hailstones from the embryo "nursery" at FL200-250 up to flight level. A value of 1067 J/kg CAPE is really on the fence but not out of the question. I absolutely do not believe this would support the type of large baseball-size type hail that would be expected to damage an airframe. The other problem is the mounting body of evidence (see SPC studies) suggesting well-sheared storms (this profile is weakly sheared) are the ones conducive to structures that support hail growth. Finally, another issue is airborne radars are highly sensitive to hail because of the strong reflectivity of ice particles, making evasive action likely. The "young updrafts" I pointed out earlier as a threat would not have provided the residence times necessary yet to contain hailstones; their main threat would be severe turbulence. I am not sure about the hail hypothesis, but I believe there is a high probability of graupel, small ice pellets, or small hail at FL350 in the storm complex (see Icing above). Finally one consideration speed is the absolute maximum hailstone size theoretically supported by a 23 m/s updraft (1067 J/kg CAPE) is about 4 cm; the relation is given by Vt=AD^0.5, where D is the diameter in cm, A is an empirical value (about 11.4), and Vt is the fall speed in m/s. If hailstones grow larger than this their terminal fall speed exceeds the updraft speed. Overall what we know for sure is weather was a factor and the flight definitely crossed through a thunderstorm complex. There is a definite correlation of weather with the crash. However the analysis indicates that the weather is not anything particularly exceptional in terms of instability or storm structure. It's my opinion that tropical storm complexes identical to this one have probably been crossed hundreds of times over the years by other flights without serious incident. My own opinion of the crash cause, as of Monday night, based on the complete lack of a HF radio call and consideration of all of the above, suggests severe turbulence (see the BOAC 911 and BNF 250 tragedies) combining in some unlikely way with CRM/design/maintenance/procedural/other deficiencies to trigger a failure cascade. We can almost certainly count on some unexpected surprises once the CVR is recovered. Until then, all we can do is await the investigation and hope that the world's flight operations stay safe until AFR447's lessons are revealed.